You know how we crave summer during winter? Well, this simple Beet Salad with Maple Candied Seeds is so delicious, you’ll forget for a brief moment that it’s cold outside. haha It’s really simple, but so fresh and flavourful. I ate it 4 times in the same week. Yum! If you have your own canned beets, use those, but it’s fine if you want to use a ready-made marinated beet from the store. You could also simply peel and slice a couple of beet roots, cook them in boiling water until tender (not overcooked), then drain and mix right away in a mix of 50:50 apple cider vinegar and water, along with a teaspoon of sugar or maple syrup. Put in a container and let cool in the fridge overnight. Voila! You’re left with a quick version of marinated beets. It’ll keep in the fridge (in an airtight container like a mason jar) for several weeks. 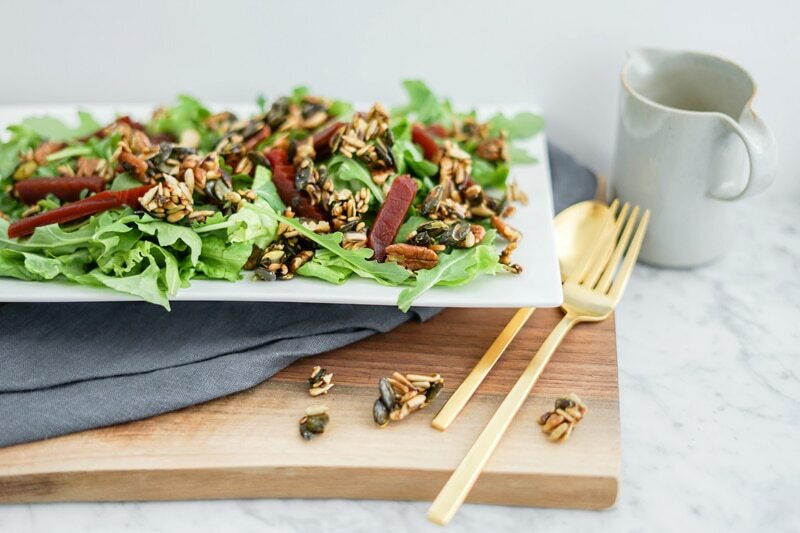 This recipe uses sunflower and pumpkin seeds along with the more traditional pecan. That’s because seeds are pretty awesome and packed with good nutrition like essential fatty acids, vitamin E, and amino acids necessary for our body to absorb other nutrients, function and perform properly. Seeds are also usually less expensive than nuts, so it’s nice to mix-and-match seeds and nuts together to stretch your dollar and eat a more varied diet at the same time. Beetroots are also pretty amazing. It’s funny because the classic red beet that we think of is also excellent to provide the nutrition our body needs to produce more red blood cells, like iron, potassium and manganese, but recent studies also showed that beets contain the protein hemoglobin, which is necessary in red blood cell formation. Isn’t that amazing? Who would’ve thought that beetroot had protein, right? 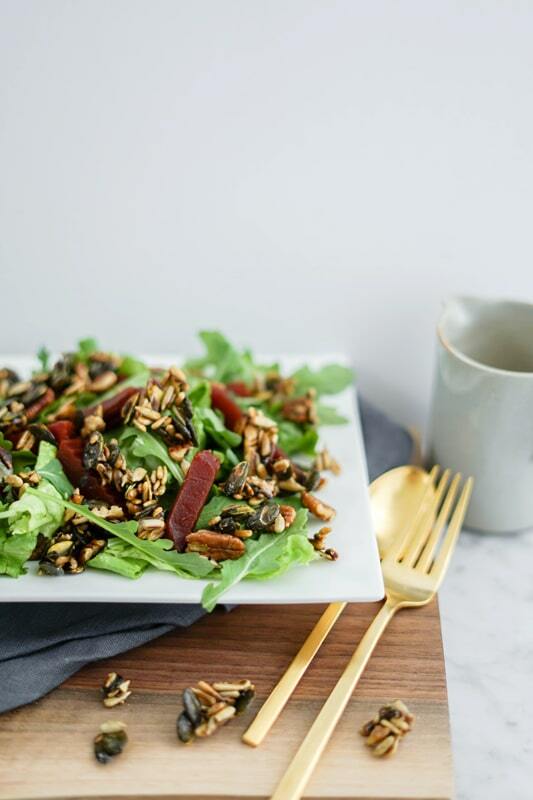 For women, it can be beneficial to enjoy a few vegetable juices containing a large portion of beet during their monthly cycle, or even enjoy a few delicious salads like this one! Yum! Plants are quite amazing and beneficial for our health, plus they taste delicious! 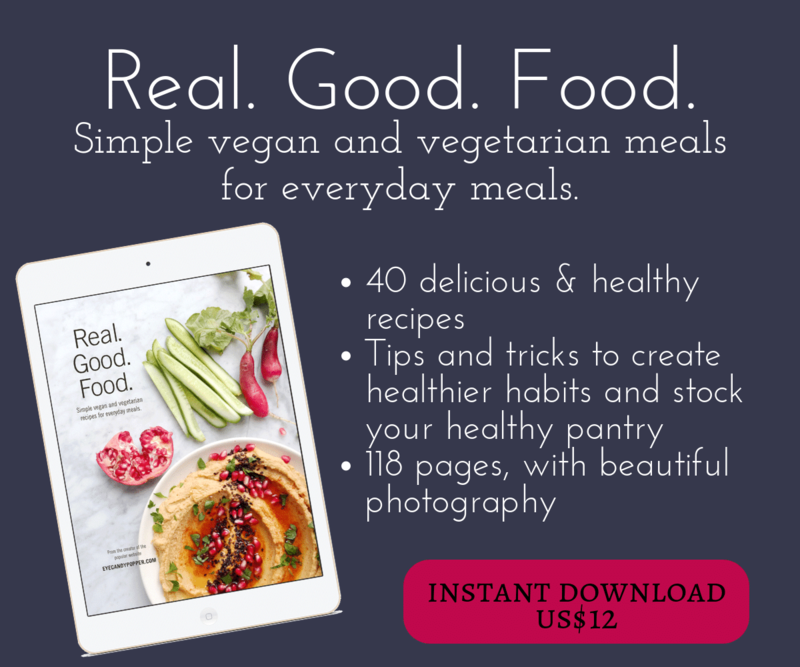 Want more beet recipes? Check out this Heart “Beet” Smoothie, or this Vegan Beet Stew, or even this incredibly delicious Mushroom Toast with Roasted Beet. 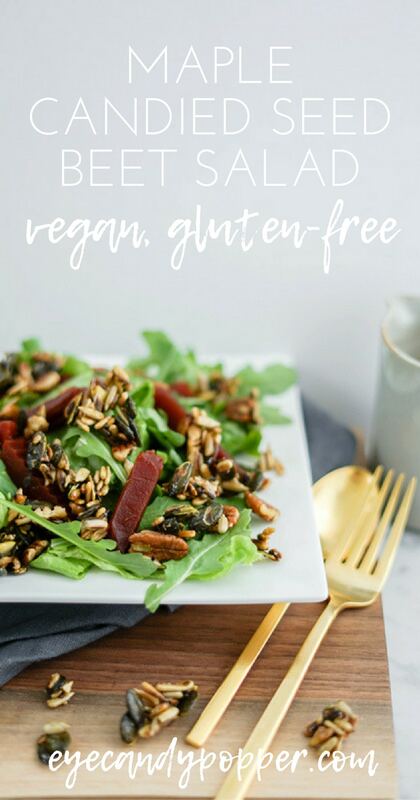 A quick recipe for Beet Salad with Maple Candied Seeds that is made in just a few minutes and will blow your mind! Great side dish! In a large pan over medium heat (no oil), toast the seeds and pecans for a few minutes, mixing them often. You want them just lightly toasted in order to keep most of the nutrients, but just enough to develop a nice nutty taste. Remove from heat and drizzle the maple syrup (or honey if you prefer) on top. Mix right away with a spoon so that all the seeds and nuts are coated. Transfer to a plate to cool off. Put the chopped salad leaves and baby arugula in a large bowl. Add the chopped beets and break pieces of the toasted seed mixture on top. Drizzle with the salad dressing. Serve immediately. If you want, serve with some organic creamy goat cheese (optional). I love beets in everything – especially salads! Looks really healthy and delicious. Beets are great in almost everything! 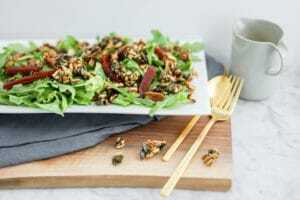 Those maple candied seeds/nuts are so good in a salad! I also like the inclusion of pickled beets, really adds a nice flavour to each mouthful. Exactly, and you know people will actually want another serving of this salad! I love adding nuts and seeds to salads, and I’m always looking for great new ways to use beets! I will definitely be trying this. It’s great to whip up in a rush, and the crunch is so satisfying! Oh, maple candied seeds! 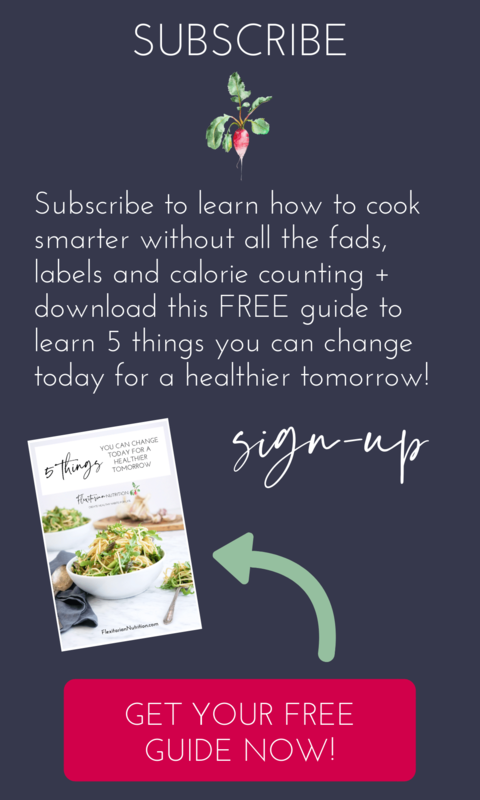 How wonderful and a great solution for my nut-free clients and friends. I love the look of the salad too and plan to add it to the menus over the holiday. I can also see it as a favourite patio salad this summer. Thank you for the inspiration, Gabby. I used your idea of maple candied seeds in the salad I made for friends last night. So good! I often use candied nuts, but had never tried seeds before. Thanks for the inspiration! 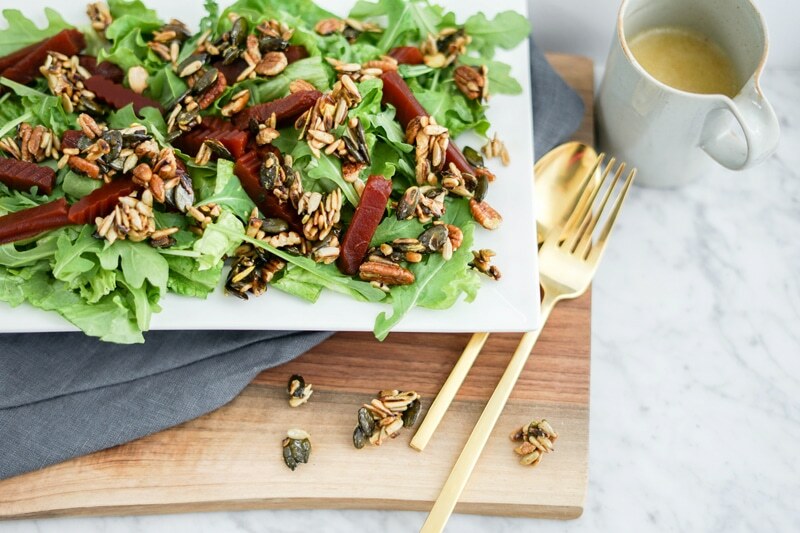 We love beet salads, and the seeds are such a nice addition in this one. Great recipe! Salads are amazing every season, and this one is so joyful, healthy for you, and delicious, that I would, like you, enjoy it multiple times a week! 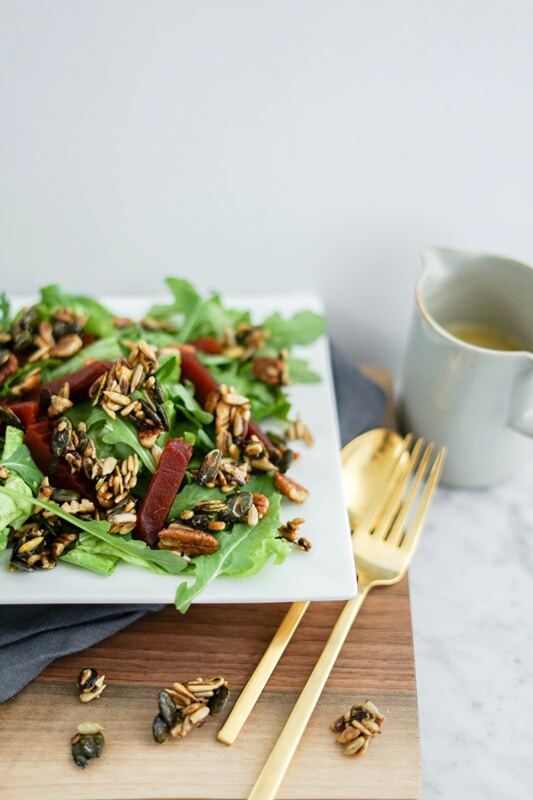 Seeds and nuts are my favorite addition to salads. Thanks Nicoletta, I know you will enjoy this salad for sure then! You’ve got some of my favourite flavours in this delicious-looking salad! That’s funny! I feel the same way. I can’t live without maple syrup! This is such a lovely salad for winter. I love the pickled beets and candies pumpkin seeds. It sounds perfect!